Back in the 1970’s Comedienne Gilda Radner created a character for Saturday Night Live that was actually based upon a real newswoman from New York Channel 7 Television. 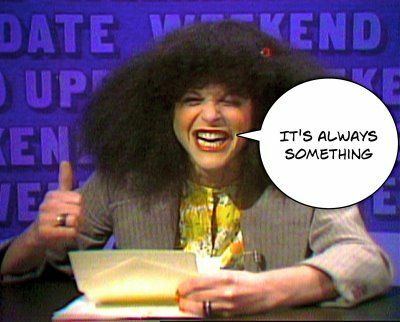 Radner’s Roseanne Roseannadanna would appear during the Weekend Update segment. One of her most popular catch phrases was when Roseannadanna’s quirky, “Well it just goes to show you- it’s always something.” And as she would wax eloquent with her rambling editorials that hardly ever made logical sense, we would also eventually hear her shouting, “I thought I was gonna die!” Well if you bid me permission- there are a few things I would just like to vent about today because it happens to be behavior that just goes to show you- you can’t assume proper etiquette in this selfie society and it makes me at times so ill- I just want to throw up my hands in the air and give up hope! For example, you would think that I would have learned by now that no matter how much good you do for others; there will still always be some people who flat out don’t like you! I don’t get it but I know it is reality. Hard to wrap my brain around how anyone can make judgments about another without ever making an effort to get to know them. First impressions are not always accurate. Just like you can’t judge a book by only reading random pages out of context; neither should anyone stir up animosity towards a person that they really know very little about. The Broadway classic “The King and I” featured a song that should be a rule of thumb before any false commentary is spread down the gossip line and that is “Getting to Know You.” Even if you summarize that I may not be your cup of tea gives you no reason to poison the pot. Another area of concern is how many adults now feel comfortable with outright lying to others. Just because you speak a fib with sincerity and conviction doesn’t instantly make it genuine. Why would somebody look you in the eye and twist the truth? Situational ethics makes a fragile floor to strand upon. Trying to rationalize stretching reality to make you look good is rather ugly. Honesty is not only the best policy; it is the only pathway to integrity. Fudging in even the smallest areas sets a lousy example for a watching audience. The truth sets you free and keeps your conscience in the clear from ever having to worry about another discovering a false face and faulty façade. Are you a man or woman of your word cause it just goes to show you that too many people who make up our everyday world are not who they claim to be! On a different note, whatever happened to teaching our children to respect authority? I refuse to allow children to call me by my first name no matter what their parents may allow. If you are a peer, I don’t mind other adults calling me Rudy rather than Pastor Rudy. But I will not permit kids to speak like I am one of their pals! They may call me Pastor Rudy, Rev. Sheptock, Mr. Sheptock, Coach Rudy- but not just Rudy. I recently tried to correct a child in our church gymnasium and was met with this smart remark, “Who do you think you are?” As Roseanna would shoot back, “I thought I was gonna die!” If I ever spoke to anybody like that growing up, I wouldn’t have been able to sit down for a week! As Aretha Franklin sang back in the 1960’s in that classic soul song- we could all use a little more R-E-S-P-E-C-T! But it must be modeled and not just assumed! Finally, what happened to having a teachable spirit? Nobody knows it all but that doesn’t stop many from behaving as if they were above being taught anything! I have never seen so many incidents of a Coach, Teacher, Parent, Spiritual Leader or Supervisor taking the time to instruct others in what to do and how to improve in the way they are doing it; only to be outright ignored and the student going right back to the bad approach and form that they began with. Is this the fruit of the “Everybody Gets a Trophy” Generation? Because we live amongst a generation where everybody makes the team and all students get an A and confrontation has become an accursed activity- is improving even a value that is championed anymore? As long as we are alive and breathing we should cultivate the following nuggets of human nature: “Faithfulness”- “Availability”- “Teachability” and “Reachability!” We are all responsible for the gifts that we have been given in this life and to comfortably camp in the corner of complacency should be anathema! Listen and you might just learn something new. Be humble and you might just discover that it is a whole lot better when another lifts you up rather than you having to constantly toot your own horn! Let’s do something about the areas that we can improve and pray for God to intervene in the instances that may be beyond our control. One thing I won’t do is just accept bad behavior and unhealthy habits! Let’s make a difference rather than become part of a defiant and apathetic population! As you know, I grew up ‘down south’. You NEVER called an adult by their first name, no matter HOW WELL you knew them. It was always ‘Miss’ so and so, or Mr. So and so. Never just their first names, if they were ‘really close family friends’ you might be allowed ‘aunt’ or ‘uncle’ in front of their names (even though they weren’t really your aunt of uncle). I always taught my kids that……you would be surprised at how many adults, even their teachers, got upset that I wouldn’t let them call people by their first names. They would argue, well, it’s my name, I’ll tell them they can call me that if I want. I would respond, that the name may be yours, but the children are MINE and I have taught them respect for their elders. Even people who have set my children’s teeth on edge, I still say they should show respect. If a person is a friend/acquaintance/co-worker of mine, they are MY peer, not my child’s, and based on that alone, they owe respect……One instance stands out, my one daughter had issue with the actions of a ‘friend’s mother’….and said she didn’t like her. I told her that she was entitled to dislike the woman, but she should still respect her position as her ‘friends’ mom.